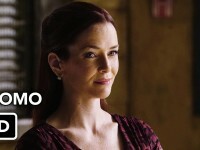 Annie Wersching guest-starred in Castle Season 6 Episode 9 titled “Disciple” as Dr. Kelly Nieman, an elite cosmetic surgeon who draws the interest of the NYPD detectives because of her connection to a murder victim. The episode aired November 18th on ABC. She will make a return appearance in Season 7 Episode 14 “Resurrection” and Episode 15 “Reckoning” airing February 9th and 16th on ABC.